The New York Times has published an exclusive look at just how a small group of Israeli Mossad agents pulled off what surely constitutes the most daring secret raid behind enemy lines in recent history which successfully netted tens of thousands of secret Iranian nuclear documents. It begins spectacularly as if a James Bond spy thriller: "The Mossad agents moving in on a warehouse in a drab commercial district of Tehran knew exactly how much time they had to disable the alarms, break through two doors, cut through dozens of giant safes and get out of the city with a half-ton of secret materials: six hours and 29 minutes." And yes, the story does make an explicit appeal to Hollywood: Last year, the spies began planning a heist that one senior Israeli intelligence official said bore a strong resemblance to George Clooney’s adventures in “Ocean’s 11”, parrots the NYT. Times journalists detail the story they received from Israeli intelligence officials (who else?) after being invited to view select documents said to have originated from the theft, which involved less than a dozen Israeli operatives hauling the "half-ton of secret materials" said to be the smoking gun proving Iran has continued to pursue nuclear weapons in spite of agreeing to abandon the program as part of the 2015 JCPOA brokered under Obama. Last April, Israeli Prime Minister Benjamin Netanyahu made precisely these charges in a televised address in which he unveiled the stolen cache of about 55,000 pages of documents and 183 CDs that he claimed comprises Iran's alleged "atomic archive" supposedly proving the existence of an illegal and ongoing secret program to "test and build nuclear weapons" called Project Amad. Days after the usually colorful and prop-laden Netanyahu presentation, President Trump announced he would follow through on prior threats to pull out of the Iran nuclear deal. Observers noted at the time that Netanyahu's address had a single audience in mind in the person of Trump during the very week the White House was intensely mulling a final decision over whether to finally pull the plug on the JCPOA. Thus we might consider this latest NYT piece, which reads like a spy hagiography with few critical questions asked of what at first glance sounds like impossible logistics of an operation that placed Mossad agents deep into Iranian territory, a propaganda victory lap of sorts meant to further bolster Mossad's reputation for far-reaching high-risk operations abroad. 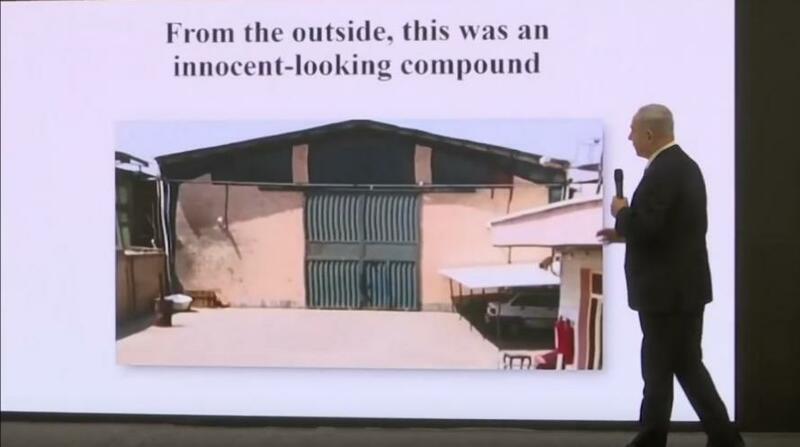 After casing an inconspicuous warehouse for two years in a commercial district which had no official ties with Iran's past nuclear development sites or with the Ministry of Defense, Mossad agents, who Israeli officials now confirm had inside help, planned to penetrate the facility which had since 2016 become a single collection point for "thousands of pages spread around the country documenting how to build a weapon, how to fit it on a missile and how to detonate it." 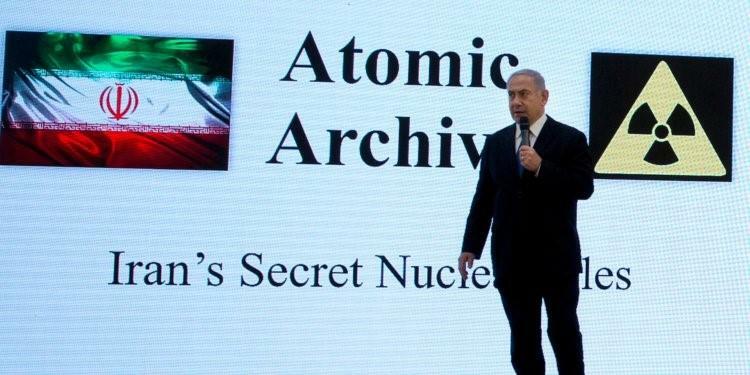 "Innocent looking compound" - Israeli PM Netanyahu presenting the Iranian documents in Tel Aviv in April. The Israelis say that because authorities were trying to keep the building completely off the radar of noticeable activity, "There were no round-the-clock guards or anything else that would tip off neighbors, or spies, that something unusual was happening there." The agents arrived that night, Jan. 31, with torches that burned at least 3,600 degrees, hot enough, as they knew from intelligence collected during the planning of the operation, to cut through the 32 Iranian-made safes. But they left many untouched, going first for the ones containing the black binders, which contained the most critical designs. The unusual and perhaps most daring aspect to the operation was that files were physically hauled out of the country and not merely copied or photographed. When it was first revealed in April, one senior Israeli intelligence official was widely quoted as saying of the covert operation, "We didn’t take everything because it was too heavy." In most Mossad operations, spies aim to penetrate a facility and photograph or copy material without traces. But in this case, the Mossad chief, Yossi Cohen, ordered that the material be stolen outright. That would drastically shorten the time that the agents — many, if not all, of them Iranians — spent inside the building. But the Israelis wanted to be able to counter Iranian claims that the material was forged and offer it up for examination by international groups. Clearly, the Israeli spies had inside help. They had learned which of the 32 safes held the most important information. They watched the habits of the workers. They studied the workings of the alarm system, so that it would appear to be working even though it would not alert anyone when the agents arrived around 10:30 p.m.
For all the cinematics of the raid, the immediate aftermath was absent much drama. There was no chase, said Israeli officials, who would not disclose whether the documents left by land, air or sea — though an escape from the coast, just a few hours’ drive from Tehran, appears the least risky. Though the journalists don't attempt to poke holes in the over the top sounding heist narrative itself, the Times does throw the captured archives into doubt, noting that "There is no way to independently confirm the authenticity of the documents, most of which were at least 15 years old, dating from the time when an effort called Project Amad was ordered halted and some of the nuclear work moved deeper under cover" and further that "The Israelis handpicked the documents shown to the reporters, meaning that exculpatory material could have been left out." Israeli PM Netanyahu presenting the Iranian documents in Tel Aviv in April. 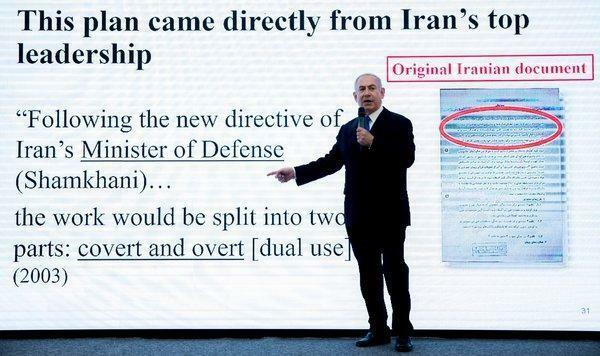 The Iranians say that the entire trove is fraudulent and called Netanyahu "an infamous liar" who "can't stop crying wolf" after his unveiling the documents in the televised address, and have previously pointed out that PM Netanyahu was personally instrumental in selling the Western public on Iraq WMD claims in the lead-up to the 2003 invasion. From what the Israelis showed to the reporters in a secure intelligence facility, a few things are clear. The Iranian program to build a nuclear weapon was almost certainly larger, more sophisticated and better organized than most suspected in 2003, when Project Amad was declared ended, according to outside nuclear experts consulted by The Times. Iran had foreign help, though Israeli officials held back any documents indicating where it came from. Much was clearly from Pakistan, but officials said other foreign experts were also involved — though they may not have been working for their governments. Thus the new Times report is interesting for what's revealed in terms of Israel's testimony of how it came into possession of the nuclear archive, but still lends credence to the IAEA's official position, reiterated immediately following Netanyahu's April 30th speech, of there being "no credible indications" supporting Netanyahu's claims of a continued Iranian nuclear weapons program after 2009. Indeed one Iran specialist in a previous op-ed for the New York Times written in the wake of Netanyahu's dramatic presentation called the supposed Israeli Mossad intelligence haul a big "nuclear nothingburger" full of things already well-known to the world, with the further implication that the intelligence operation that netted the files itself appears hokey and untrustworthy. Also at the time, former Israeli National Security Advisor Uzi Arad in response to Netanyahu's claim that Iran lied about its nuclear program, said that "at no point was there any indication that Iran violated the agreement." The Israelis have reportedly shared the documents with allied intelligence agencies, specifically the CIA, and are said to be continually translating the trove of tens of thousands of Persian language documents, which also include photographs and video of sensitive nuclear facilities. It will be interesting to see if a true and irrefutable "smoking gun" document does eventually emerge from the trove as so far not even the Times seems fully convince, despite the jaw-dropping account of the heist.